The first detection of gravitational waves occurred on 14 September 2015 at the land-based Laser Interferometer Gravitational-Wave Observatory (LIGO). Using optical folding techniques, LIGO has an effective baseline of 1,600 km (994 miles). See my 16 December 2015 and 11 February 2016 posts for more information on LIGO and other land-based gravitational wave detectors. 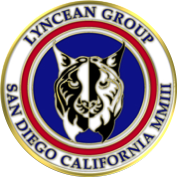 These projects are discussed below. 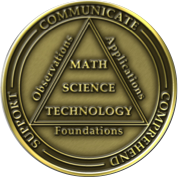 The LISA project originally was planned as a joint European Space Agency (ESA) and National Aeronautics & Space Administration (NASA) project to detect gravitational waves using a very long baseline, triangular interferometric array of three spacecraft. Each spacecraft was to contain a gravitational wave detector sensitive at frequencies between 0.03 mHz and 0.1 Hz and have the capability to precisely measure its distances to the other two spacecraft forming the array. 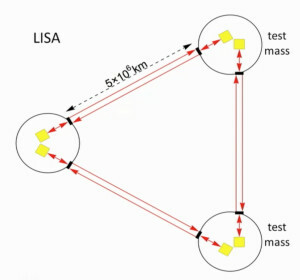 The equilateral triangular array, which was to measure about 5 million km (3.1 million miles) on a side, was expected to be capable of measuring gravitational-wave induced strains in space-time by precisely measuring changes of the separation distance between pairs of test masses in the three spacecraft. In 2011, NASA dropped out of this project because of funding constraints. The LISA Pathfinder (LPF) is a single spacecraft intended to validate key technologies for space-based gravitational wave detection. It does not have the capability to detect gravity waves. This mission was launched by ESA on 3 December 2015 and the spacecraft took station in a Lissajous orbit around the Sun-Earth L1 Lagrange point on 22 January 2016. L1 is directly between the Earth and the Sun, about 1.5 million km (932,000 miles) from Earth. 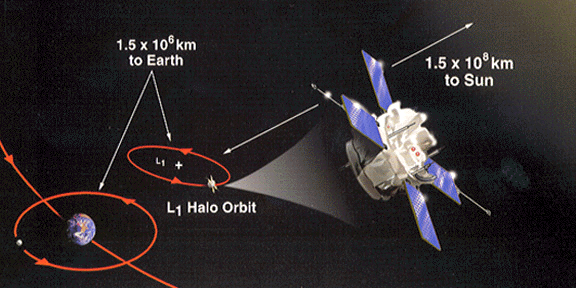 An important characteristic of a Lissajous orbit is that the spacecraft will follow the L1 point without requiring any propulsion. This is important for minimizing external forces on the LISA Pathfinder experiment package. The approximate geometry of the Earth-Moon-Sun system and a representative spacecraft (not LPF, specifically) stationed at the L1 Lagrange point is shown in the following figure. 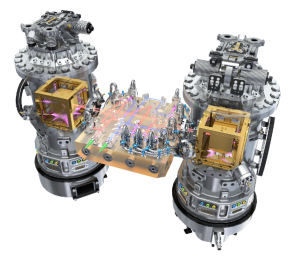 The LISA Pathfinder’s mission is to validate the technologies used to shield two free-floating metal cubes (test masses), which form the core of the experiment package, from all internal and external forces that could contribute to noise in the gravitational wave measurement instruments. The on-board measurement instruments (inertial sensors and a laser interferometer) are designed to measure the relative position and orientation of the test masses, which are 38 cm (15 inches) apart, to an accuracy of less than 0.01 nanometers (10e-11 meters). This measurement accuracy is believed to be adequate for detecting gravitational waves using this technology on ESA’s follow-on mission, eLISA. 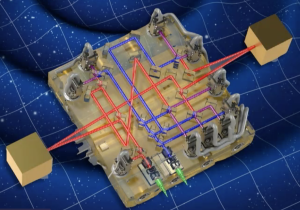 The first diagram below is an artist’s impression of the LISA Pathfinder technology package, showing the inertial sensors housing the test masses (gold) and the laser interferometer (middle platform). The second diagram provides a clearer view of the test masses and the laser interferometer. LPF successfully validated the technologies used in the local (in-spacecraft) instrument package (test masses, inertial sensors and interferometer). LPF interferometer noise was a factor of 100 less than on the ground. The measurement instruments can see femtometer motion of the test masses (LPF goal was picometer). 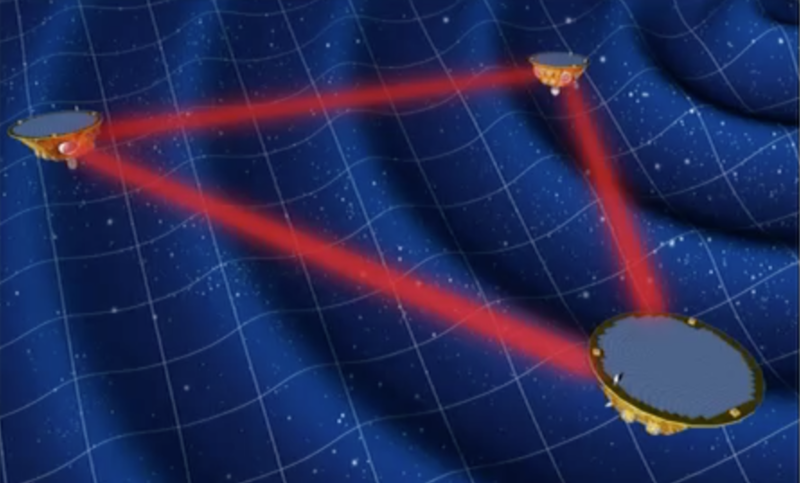 As shown in the following diagrams, three eLISA spacecraft will form a very long baseline interferometric array that is expected to directly observe gravitational waves from sources anywhere in the universe. In essence, this array will be a low frequency microphone listening for the sounds of gravitational waves as they pass through the array. This needs to be done for each of the three legs of the array. LPF validated the technology for making the test mass to spacecraft measurement. Significant development work remains to be done on the spacecraft-to-spacecraft laser system that must take precise measurements at very long distances (5 million km, 3.1 million miles) of the relative motion between each pair of spacecraft. In the 6 June 2016 LISA Pathfinder briefing, LPF and ESA officials indicated that an eLisa launch date is expected in the 2029 – 2032 time frame. Then it reaches its assigned position in a trailing heliocentric orbit, eLISA will be a remarkable collaborative technical achievement and a new window to our universe.